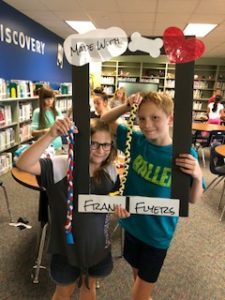 This is the third year for Makerspaces in Frank’s Library, where students work in small groups to create things and solve problems without teacher directions. I attended professional development for Librarians in Frisco ISD in June and heard about MakerCare projects. I researched to see what students could create as a MakerCare project. I went on to read how dog chew toys could be made out of recycled shirts. I knew immediately this is something I wanted to add to our library this year since our students would love this idea, and my own dog was a rescue dog. 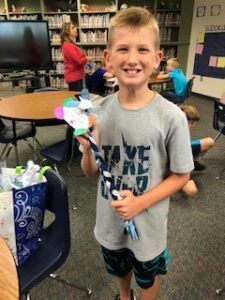 After learning about Culture for Caring in Klein at the beginning of the school year I was determined to bring a MakerCare project to Frank. So I added a MakerCare project as one of the stations to give the kids’ creations new purpose. 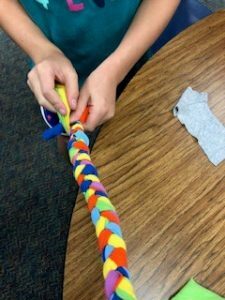 Children naturally enjoy creating and making things for others, and this year they will see their inventions put to use in their own community. We have many people who foster dogs in our Gleannloch neighborhood, and we have rescues that take care of dogs while they wait to be adopted. I contacted a few rescues to see if they would take our donations, and they were excited and said yes! They told me a new toy would be given to the family that adopts a dog. 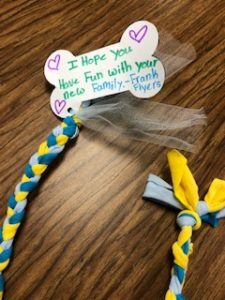 Frank students set to work and created different sized dog toys out of recycled t-shirts and attached sweet notes to the new families. Our community supported us by donating recycled shirts cut into 2 inch strips, and some volunteers helped cut shirts to help with this project. Through compassionate, hands-on activities we can inspire students to do good. We are striving to make our community and our world a better place. This is one small project that will invest in future citizens who care.